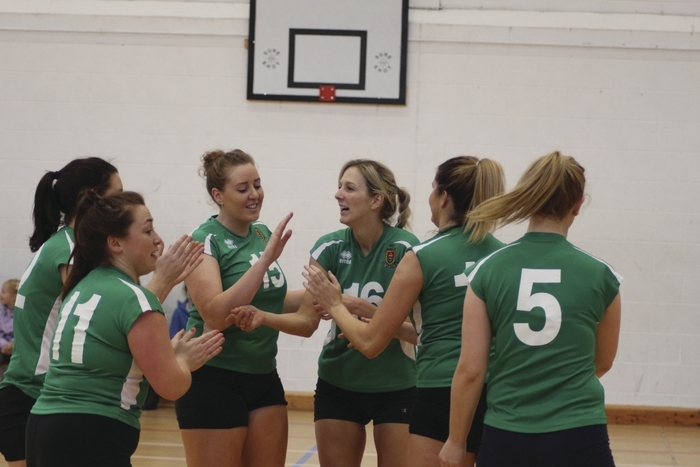 Winning feeling: Mayo have claimed the division two title in the National Volleyball League. Mayo Volleyball Club last weekend won the national league division two title after defeating second placed Santry in Kiltimagh. Mayo came into the game full of confidence but were forced to fight all the way in a game that extended to the maximum five sets. The Westerners began well with a flurry of good hits but after weathering a late storm from the Dubliners, quality serves from Paulina Balik Nowak helped Mayo close it out winning 25-18. Mayo grew in confidence in the second set and inspired hitting from Diletta Baratto helped them comfortably dispatch Santry 25-12. Santry were not leaving without a fight though as they got the better of Mayo's defence time and again in a tight encounter. As the set wore on the north Dubliners got the upper hand winning 25-23. Santry now saw blood and maintained resilience in the fourth set. They continued to find holes in Mayo's defence and once they pulled ahead theynever looked back as they won 25-21. At two sets apiece the match went to a tie breaker. Mayo, however defended much better in the final set and inspired by some fine hitting by Edel Nolan and Diletta Baratto won the set in determined fashion 15-8, and the match 3-2. With one match to spare Mayo have claimed the division two title in their maiden season. Mayo's final game against Aer Lingus Kestrels in Kiltimagh in a fortnight's time will not affect the outcome but they will be spurred on in their question to finish the season with 14 wins out of 14. After the game Mayo player Mikal O'Boyle said: "We are thrilled after winning the title in our first season. When we started up last June we didn't really know if we could start as soon as this season but it all came together. Santry pushed us all the way and we are very determined to finish the season in a clean sweep of victories in two weeks time."